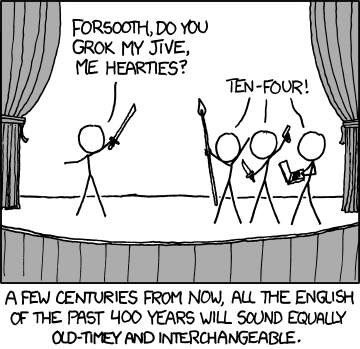 This recent XKCD cartoon made me think of Miles Efron’s project on language change and information retrieval. Perhaps the tools he develops will help scholars in the future parse what we declaim to our tweeps. A REALLY ambitious project: anticipate that few-centuries-from-now English! I bet you could do that with some clever tweaking of a generative algorithm. For maximum effect, you’d probably want to juxtapose language models from different time periods.